In a city of 1.5 million, there are just a few public lavatories, which often remain closed; causing embarrassment and inconvenience to people in Srinagar. Saima Bhat reports. Doctors have advised Muneer Ahmad to take lot of fluids as he has kidney stones. He works in an insurance company and most of the time he is on the move – meeting clients. He says he has to face embarrassing moments when he needs to go to a bathroom, as there are a just a few in the whole city. “I use the wash room very frequently no matter if they are without water or are stinking because otherwise I get a terrible abdominal pain,” says Muneer. Recently while travelling on Zero Bridge, he felt the need of using a bathroom. Luckily there was one nearby. “When I looked for the public utility, it was closed. I was left with no option but to urinate in the open,” says Muneer. Most public utilities are either in or close to Lal Chowk and in other parts of the city are only a few and far between. Visitors to Srinagar and those who work there have to face immense hardships due to the lack of public conveniences. Women have to face more problems on this count. Saba is a working woman and leaves home early in the mornings. Once, she needed to use a washroom near Qamarwari but could not find any. Being a girl she hesitated to ask people for public washroom. “I entered a big house. When I knocked at the door a woman of my mother’s age came out. I asked her to please let me use their washroom but she replied, ‘we don’t have a washroom.’ While coming out of the house I saw a school nearby and went there to find a washroom instead,” says Saba. In the past, a small concrete wall on a roadside, open from both ends, hiding behind some partitioned sections with a foul smell spreading for miles, was enough to predict that it is a site of public convenience, most appropriately a site for men’s convenience. Such lavatories were present at a number of places, but with time, officials realized such facilities need a dedicated space and some complex structures were built with two separate sections for men and women. The Srinagar Municipal Corporation that takes care of the public latrines runs 60 lavatory blocks in Srinagar. They were supposed to build 20 more under the Jawaharlal Nehru Urban Renewal Mission, but due to non-availability of land, only 12 lavatory blocks could be built in four years, say SMC officials. Most of the toilets run by the SMC are in terrible condition, says an employee of the corporation wishing not to be named. At most of the places there is no running water and many of them stink causing hardships for the people around, he adds. Manzoor Tarray, chief sanitation officer SMC says, “We are not able to maintain our lavatory blocks and now we have gone for outsourcing.” He adds that they generate very low profit, one rupee per use which generates an income of just a few thousand rupees. “Low profit has forced SMC to handover some (lavatory) blocks to private companies like Sulabh International,” says Tarray. Sulabh International is a social service organization which runs 17 toilet complexes around Srinagar, from Hazratbal to Soura hospital and from Lal Chowk to Batamaloo bus yard, in collaboration with Economic Reconstruction Agency (ERA). They charge two to three rupees per use and say they were the first to introduce the pay and use system, in 1974. Sulabh operates 6,000 public toilet complexes across 25 states and four Union Territories, which are used by over ten million people every day. However, in Kashmir only two toilet complexes run by them, in KMD bus yard at Lal Chowk and Batamaloo bus stand. Bashir is not the only one who has to give money out of his pocket; Fahmida is a caretaker of an SMC run lavatory complex in Pratab Park. Every morning, she cleans the toilet and has the responsibility of collecting usage charges. Her colleague who has the responsibility of the men’s section says, “The men’s section is used more than the women’s section. Whatever might be the case we have to show an income of rupees 50 per day which usually goes from our pockets.” Their salaries are around Rs 15,000 a month each, but they feel ‘cheated’ when they have to deposit money from their pockets if there is a shortfall in target revenue. It is the duty of the corporation to provide dedicated space for public conveniences but it has failed, to a larger extent, in providing such facilities in Srinagar. 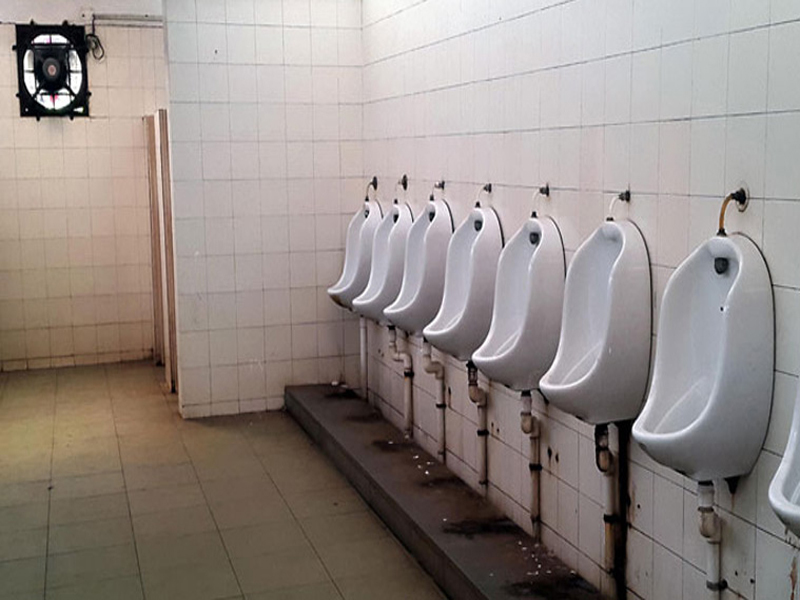 But Manzoor says, “We can’t do anything, our staff has a shift of 9 to 4 but before and after that timings we have to keep these lavatory blocks open for public. There have been number of instances when taps and other things have been stolen from these public toilets”. Around 90 employees of the SMC are manning these public toilets. The “working” lavatories usually are usually marred with problems such as lack of water supply, or they are very dirty and stink. In the lavatory at Abi Guzar, there is no water from the past seven days as the water pump motor is in disrepair, and same is the case with the toilet block in Pratab Park.